Emily and Christa decide that they need a distraction from Christa's dissertation and Emily's recent break up with her boyfriend and decide to cast an ancient spell for run. They never imagine for one moment the spell will work and suddenly find themselves saddled with a demon. If that were not enough to deal with, the summoning brings them to attention the synedrion - the magical police. They may have stumbled into the supernatural work on a whim but learning to deal with what they have entered is going to take all of their time and may cost one of them their life. 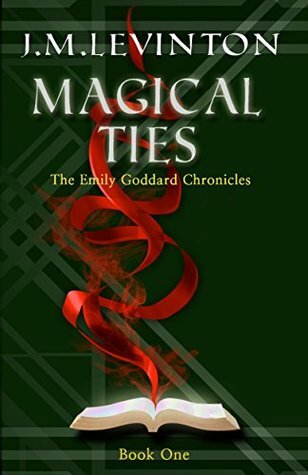 Magical Ties just sort of stutters along at the most plodding pace. At about the 60% mark I started thinking about chalking this up to a DNF, simply because it felt like the story was headed nowhere. This in part is because of the time that Levinton spent setting up the world. There's only so many times you can be amazed with Emily learning that werewolves exist, or that elves exist or that vampires exist. It would have been simpler had she been told that just about everything supernatural that you can imagine exist and then have the story move along. Look, I get that there's going to be growing pains when a normal person suddenly learns about the existence of the supernatural but that's not a reason to dwell on it to the degree that Levinton did. There's an element of romance in the story; however, Magical Ties is far from a paranormal romance. It's clear that she intends the relationship between Emily and Thomas to grow organically and I really like that. Everyone around them seems to be aware of their attraction even as they remain ignorant of it. In later books, if Levinton decides to go through with the romance, I hope that she deals with the power imbalance between Thomas and Emily. Thomas clearly is magical and extremely powerful, while Emily is a normal talent-less human. It's all further complicated by the fact Thomas is Emily's boss. The largest redeeming element for me about this story is the relationship between Emily and Christa. Far too often in this genre, authors seem to write the story of one woman surrounded by men. In the case of Magical Ties, the female characters far outnumber the male characters. Magical Ties also passes the Bechdel Test easily. I love that the women come together to support each other and the relationship between Emily and Christa in particular is incredibly strong. As a protagonist, Emily is an interesting character. Though the supernatural world is all new to her, she's absolutely prepared to learn. Emily may not have any magical powers but she doesn't doubt her abilities to be of aid to Thomas with her awesome administrative assistant skills. Like most working women who achieve a position that is considered valuable, Emily is often accused of sleeping with Thomas to get her job. In this case it's ironic because she didn't want the job in the first place. Emily however refuses to be bullied by the magical community and stands up for herself each time she is attacked. Other than the slow dragging plot, Magical Ties really falls down on its ableist language. People who play with magic to get power or out of curiosity often end up opening a can of worms they are not prepared for. We are told several times during Magical Ties that if they are lucky they end up dead, if not lucky they end up hurting many before being stopped and end up in psychiatric hospitals. Because the supernatural is a closely guarded secret, a murderer who talks about demons etc., is going to be perceived as mentally ill. The fact that these supposedly mentally ill people are all violent in some way plays upon the ableist trope that the disabled present a threat. Levinton does manage to dial back the ableism a bit when it comes to Elena - an empathetic person of short stature. Elena is initially distrustful of Emily having been subjected to negative feelings people have about her height but when she picks up on the fact that Emily completely accepts her for who she is, the relationship begins to change. Levinton really works to portray Elena as just an ordinary annoying teenager despite her magical ability and short stature and I really liked this. I really didn't expect Levinton invoke addiction in this story. Christa is given a demon book which she binds herself to with a drop of blood. Emily watches in horror as her sister gets deeper and deeper into the book and seems unable to put it down. It would have been really easy for Levinton to come up with a magical solution to the problem they created but instead, Christa has to go through a form of rehab to learn to deal with her compulsion to read the book. I really appreciated this and love that there's no easy solution. Now that the world has been set up in detail, I hope that in following books, Levinton will start to move the meta along. I have no doubt that this story has the seeds for any interesting story it just didn't get there in the first outing. If however this is the setup for something good to come, it might well be worth the investment in time. At this point however, the jury is still very much out.